Is your charity ready to scale its fundraising? Then sign up to the biggest new national fundraising challenge! Struggling to find resources to organise events, buy golden bond tickets or organise fundraising challenges? The Million Steps Challenge allows the smallest community group to the largest international charity to scale their fundraising efforts and get people moving! Our challenge and fundraising platform allows you concentrate on doing good, while our innovative eco-system handles the rest. No big spend, no scrabble for places at golden ticket events, no headaches over organising. Be the first 100 charities at just £350 + VAT for 10 places and onboarding to the system. Register now for your early bird place on the national Million Steps Challenge September 2019. Register you charity and get your own Million Steps Challenge page. Shout it out to your supporters and on social media. 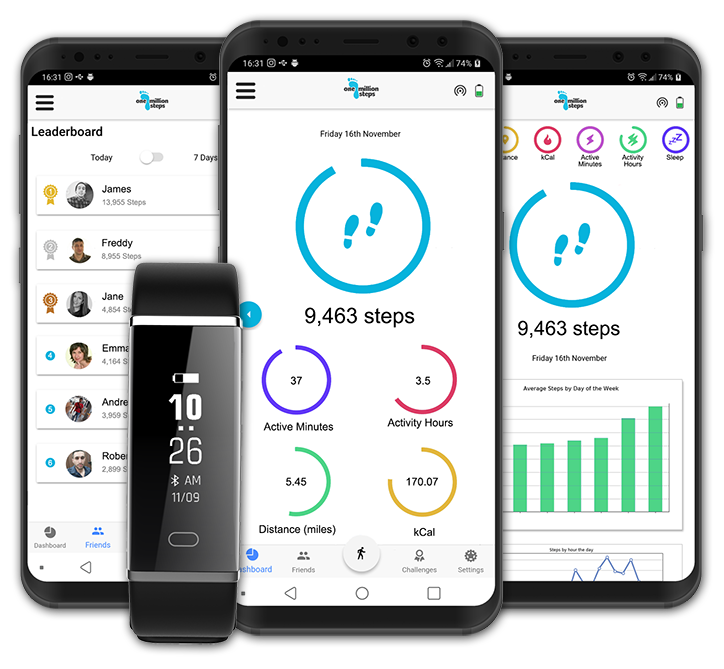 Your supporters receive a pedometer and app to track their steps, active minutes, distance and the calories they burn. And then off they go! Challenging their friends, forming teams and cheering each other on! Raising money shouldn’t be hard work – at least, not for your supporters! Leave the heavy lifting to our integrated fundraising system which encourages participants to blast out achievements to raise funds for your charity and lets donors follow the journey. It’s a 100 day journey and we care about health and wellbeing. 500 miles is amazing and we want you to be your best. From habit loops to food labels and meditation to body strength content and videos to keep you moving – because every step counts! From signing up to the challenge to creating your branded home page and sharing with your supporters – we go the extra mile so you don’t have to! Sign up following our simple process. Build your charity challenge home page with our easy-to-use template. Share with staff and your supporters. We do all the heavy lifting to save you time and resources! Integrated fundraising and Gift Aid collection. Donation tracking and fundraising goals to keep an eye of the impact of your supporters. Hosted profile page and supporter sign up – no need to set up an external site. Only 100 places - sign up now!